The local market faced plenty of negative influences today and despite being down more than 1%, its fair to say it held up reasonably well in the face of plenty of pressure. 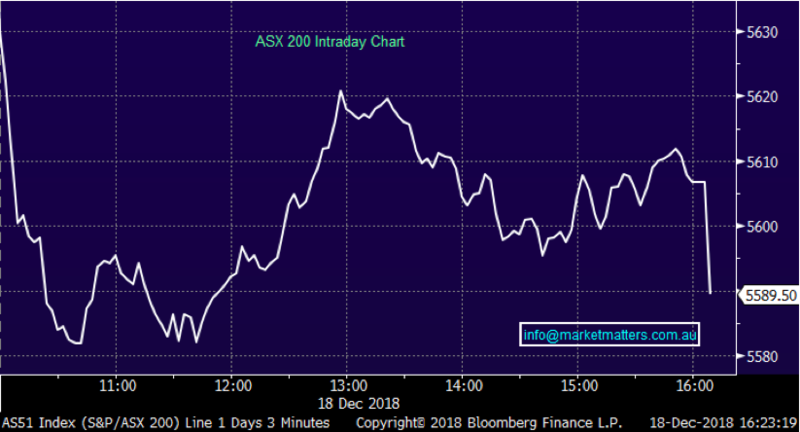 A poor USleadwhich saw the three major indexes each finish more than -2% lower on the session had the ASX200 poised to open back below 5600 – which it did, before clawing its way back above that level and enjoying most of the afternoon above it, but finally succumbing on the death assome big futures orders hit the tape, forcingthe index 17pts lowerin the final 10mins. The banks felt the pinch today, both NAB & Westpac tumbled to new 6-year lows. 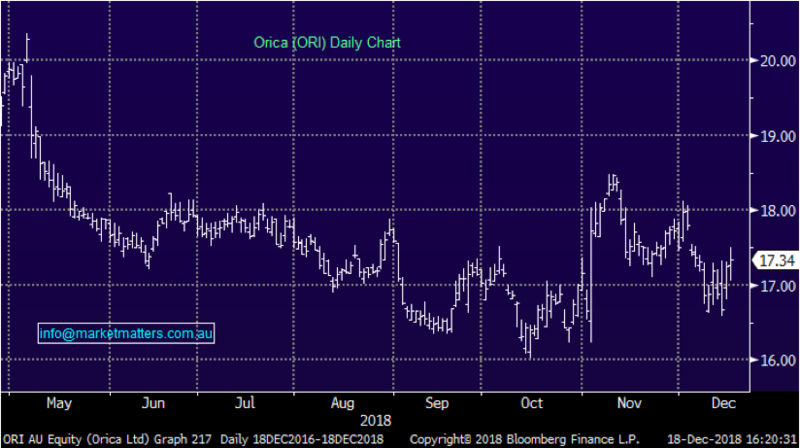 Energy also dropped as global growth fears popped up again as well as analysts posting bearishnotes on the oil price as more and more non-OPEC and low cost production comes onlinewhile the Tech sector was also on the nose. Resources though were reasonably well supportedin a soft market. Media names took a hit today as reports that advertising spend had fallen 10% year on year. 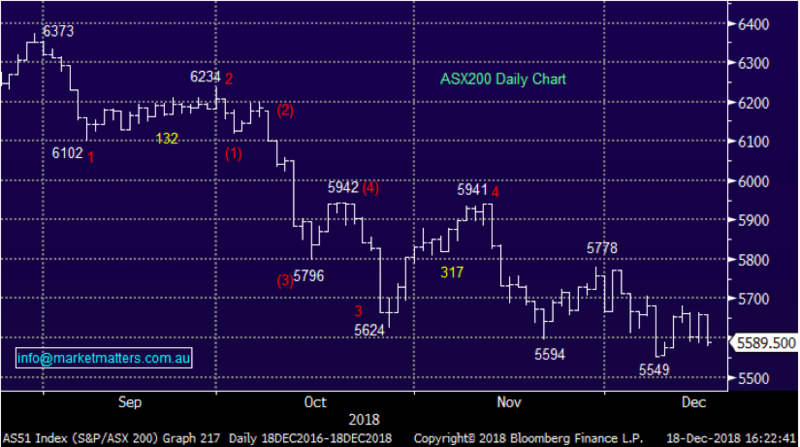 The other halfof the consumer services index, the telcos, were strong with traders looking for defensive names, and the telcos bouncing back from the recent ACCCinfusedweakness. On the corporate side the news flow continues to stay subduedas many start to take holidays. Fletcher Building (ASX: FBU) was active though, selling one of their international businesseswhich we discuss below. 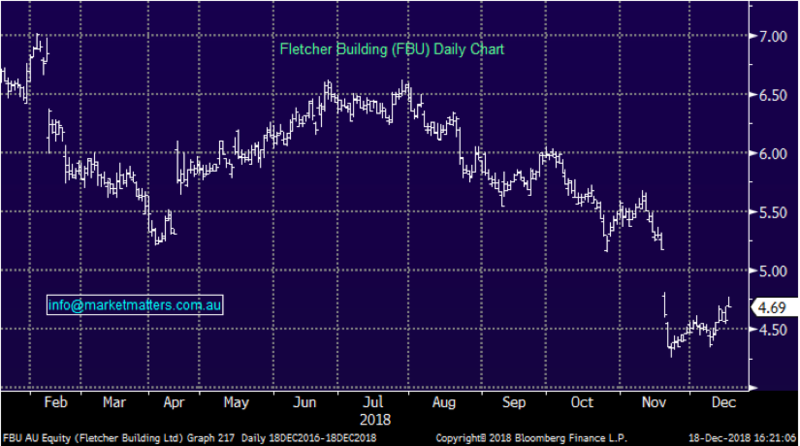 Fletcher Building (ASX: FBU) $4.69 / +2.4%; Construction product manufacturer Fletcher Building has bucked the market weakness to trade higher into the afternoon following the announcement of the sale of their Formica business. Fletcher will receive $US840m for the sale of the international laminates and panels business, that was deemed as non-core to the Fletcher business, to a Netherlands based holding company Broadview. While there are a few regulatory hurdles to jump, no hiccups are expected and the company intends to complete the sale early next year. The deal has been seen as a positive for Fletcher with the sale price higher than the market could have expected. Just 4-weeks ago, the FBU share price fell significantly on soft guidance for FY19. The business was been squeezed by falling construction rates across Australia and New Zealand in both residential and commercial construction.